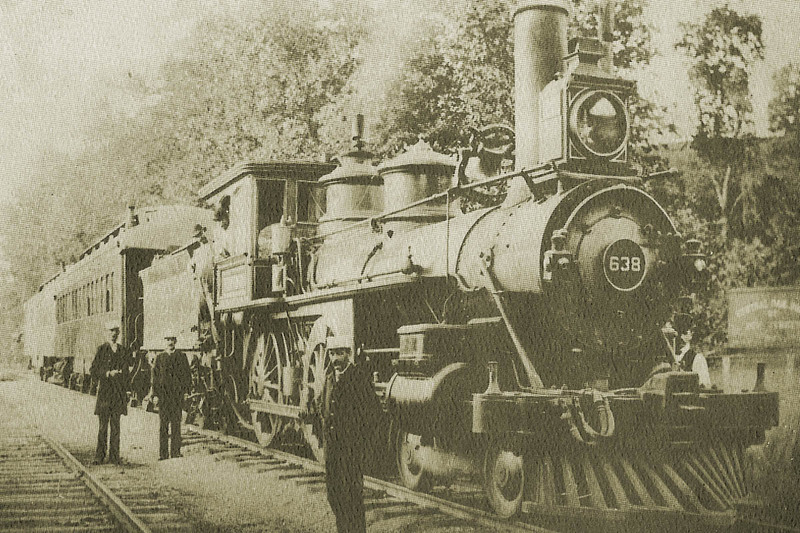 The Wilmington & Western Railroad was chartered in 1867 to move goods from the mills along the Red Clay Creek to the Port of Wilmington, and officially opened for freight and passenger service on October 19, 1872. Three passenger trains and a mixed freight train operated six days a week on nearly 20 miles of track between downtown Wilmington, DE, and Landenberg, PA. Much of the line ran through the Red Clay Valley, bustling in the late 19th Century with farms, small villages and water-powered mills. Excessive construction debts and poor management caused the line to fall into foreclosure in 1877, just a few years after opening. New owners reorganized the line as the Delaware Western Railroad, which became highly profitable moving kaolin clay, vulcanized fiber materials, snuff, iron and coal to and from the many mills that lined the route. In the 1880s, the line was purchased by the Baltimore & Philadelphia Railroad (B&P), a subsidiary of the Baltimore & Ohio (B&O). Purchase of the line by the B&P provided the Baltimore & Ohio with an access route to compete with the Pennsylvania Railroad for passengers and freight traveling between Washington, Baltimore, Philadelphia and New York City. The line became known as the "Landenberg Branch" by the B&O and was, for a time, its most profitable branch line. 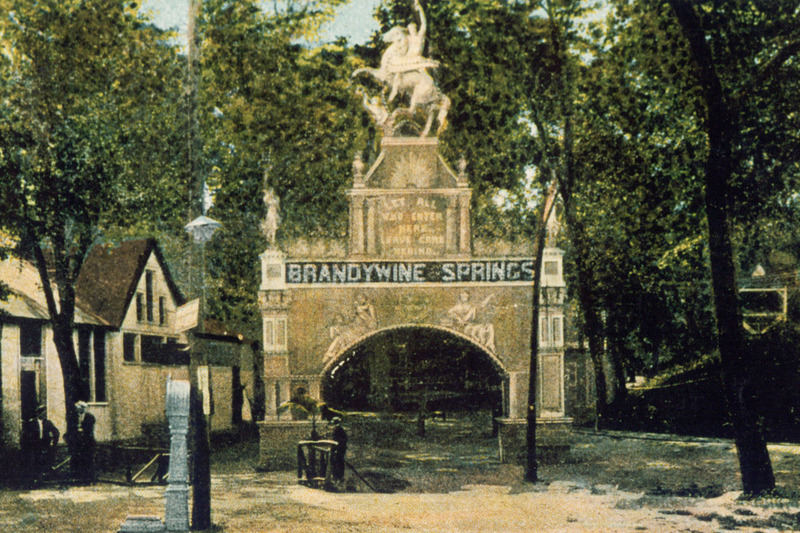 When a resort opened along the railroad in the late 1880s at Brandywine Springs, the passenger business flourished as people from around the region came to the park to escape the summer heat. They came to enjoy the fun house, pony rides, carousel and live entertainment. The park closed in 1923, and the passenger business ended on September 28, 1930, a victim of the Great Depression. Shortly thereafter, the Pennsylvania Railroad discontinued its connecting service to Landenberg. With trucks and automobiles gaining in popularity, the Landenberg Branch saw a sharp decrease in freight traffic, and the line was first shortened to Southwood, DE, in the early 1940s, and shortened again to Hockessin, DE, in the late 1950s. In the mid-1960s, Historic Red Clay Valley Inc. (HRCV) was formed and began leasing the tracks from the B&O on weekends beginning in 1966, operating steam-powered tourist trains between Greenbank Station and Mt. Cuba, located mid-way between Greenbank and Hockessin. In the mid-1970s, the line's new owner, The Chessie System, determined that the line had become a financial burden and filed for abandonment of the line - fundraising by HRCV began immediately. In August of 1982, the remaining 10.2 miles of the Landenberg Branch were purchased by HRCV. For three days in September of 1999, Hurricane Floyd pounded the East Coast, destroying two of our wooden bridges spanning the Red Clay Creek, damaging 11 others and causing numerous washouts along the line. A year later, volunteers and contractors had repaired most of the line between Greenbank and Hockessin, and on November 25, 2000, the first revenue train made its way west to Mt. Cuba. The Wilmington & Western had overcome a major natural disaster in just 18 months, but the railroad would soon discover that Mother Nature had more in store. On September 15, 2003 (one day short of the fourth anniversary of Hurricane Floyd), the remnants of Tropical Storm Henri stalled over southern Chester County in Pennsylvania and produced record amounts of water in the Red Clay Creek. 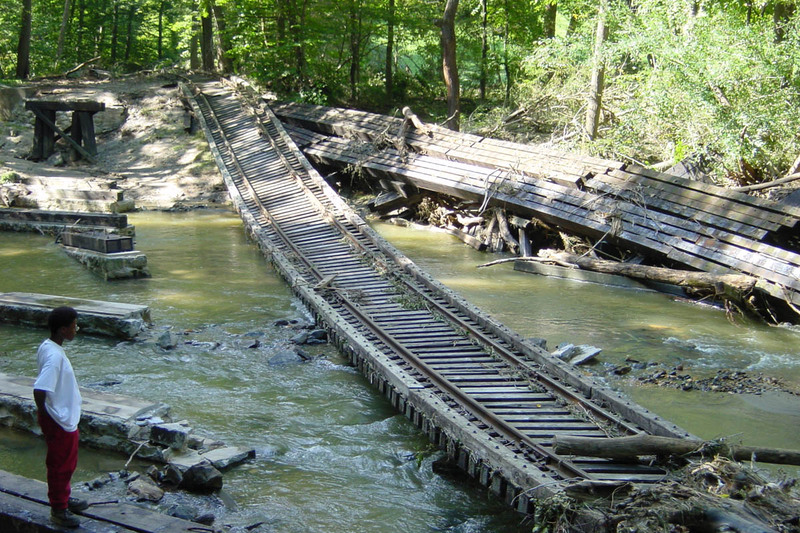 The rushing waters tore through the Red Clay Valley, destroyed six of our historic bridges, and reduced our railroad from 10 miles to two. We persevered (and continued to operate on the remaining section of track) while we rebuilt the bridges to withstand future flooding. As each bridge was rebuilt, our revenue trains went further and further up the line, and we also used the seldom-seen portion of our line between Greenbank and the CSX Interchange at Centreville Road. On June 30, 2007, our Royal Blue coaches, behind a gleaming locomotive 98, triumphantly entered Hockessin, DE, for the first time in almost four years - the Wilmington & Western was reborn! 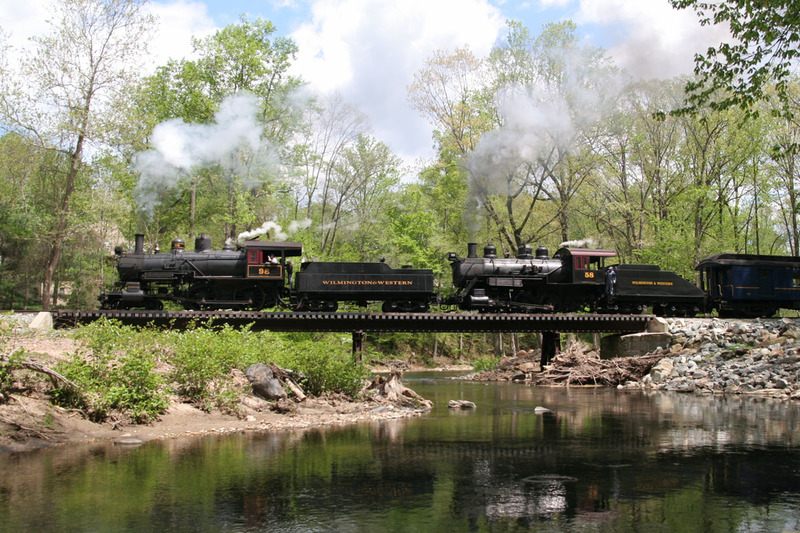 Today, our railroad continues to operate regular steam- and diesel-powered tourist trains on our full 10 miles of track between Greenbank and Hockessin. Our operating season kicks off in the Spring, and runs through December 30, with trains departing nearly every weekend. In recent years, our railroad has become a popular site for weddings, birthdays, family reunions and a variety of other events, and chartered trains are available year-round. Our Board of Directors, staff and volunteers contribute countless hours of work each year into making the railroad the successful enterprise it is today, and they do it so that future generations will have a living awareness of the history, industry and beauty of the Red Clay Valley.